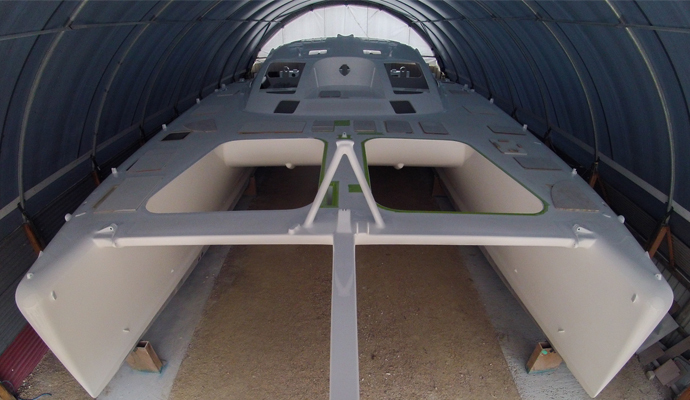 The Hoult Spirited 480 project in Tasmania is getting close to launch with the painting now complete. Michael Hoult has reported that he is very pleased with the result and the paintwork is first-class. The target date for launch is March/April next year and we can't wait to see the first of this design on the water. Both inside and outside have been sprayed in high quality 2 pack polyurethane to a very high standard. The next exciting task is to install the deck hardware and fittings followed by the windows. Michael expressed that his enthusiasm is at an all-time high now that all the sanding is done! We will keep everyone informed of any future progress that comes to hand.